A trek to Sandakphu is not easy, but is surely a rewarding one. Sandakphu is a trekker’s paradise in West Bengal; whilst offering the most majestic views of the Kanchenjunga range. If you’re yearning for a break from your routine life, head to Sandakphu to embrace the simple, peaceful and joyous life of the hills. You can revel in the quietude of the high peaks from your balcony, and enjoy the panoramic views of the very best that nature has to offer. However, if you want trek your way to Sandakphu, these are the places that you must not miss. If you’re trekking to Sandakphu, you’ll be starting at Manebhanjan, a small town near Darjeeling, in all likelihood. Manebhanjan has villages of both India and Nepal visible on either side of the border, and it’s highly recommended that you camp here for a night for a delightful experience. In case the steep slopes of Manebhanjan are particularly challenging for you, try beginning the trek at Chitrey. The place is swept with vast expanses of lush greenery: towering oaks, pines and firs strewn as far as the eyes can see. Chitrey also has an exquisite monastery that is a must visit. For those taking a short cut to Sandakphu, you’ll cross a small enthralling town of Tonglu on the way. Be prepared to be struck by the beauty of the picturesque Tonglu Lake. Perched on top of a hill, Tonglu also acts as a wonderful resting point, if you’re exhausted after a long, winding trek. Another beautiful spot that’ll fall on your trek is Tumling. 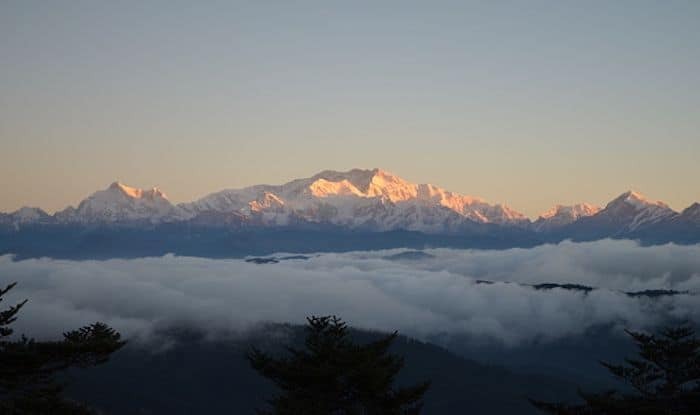 Technically, Tumling is a small village in Nepal, just a few kilometres from the Singalila National Park checkpost, which is the entry point to Sandakphu. The trek from Tumling is marked with colourful flora, and a delightful combination of winter trees. The last milestone before you reach the lovely town of Sandakphu, is Bikeybhanjan. It’s a daunting task to get there; however, it’s worth it once you set eyes on the pristine mountains peaks and lively flora all around.